A Matter of Balance is an evidence-based program designed to reduce the fear of falling and increase activity levels among older adults. The program acknowledges the risk of falling but emphasizes practical coping strategies to reduce this concern. During class, you will learn to view falls and fear of falling as controllable and to set realistic goals for increasing activity. You will also find ways to change your environment to reduce fall risk factors and will learn simple exercises to increase their strength and balance. What kind of topics will we cover? We will talk about Mobility Issues, Balance Problems, Multiple Medications, Home Hazards and Deficits and Exercise! When and How long is the class? It is an 8 weeks class, 2 hours each week. Class will meet every Tuesday, January 10th – February 28, 2017 from 10:00am to 12:00 noon. Will there be Sign Language Interpreters? Of Course! 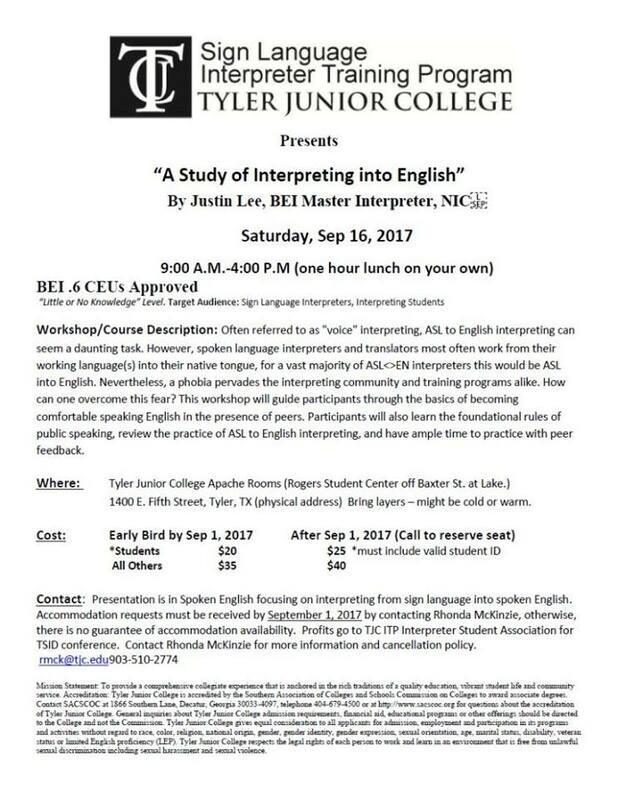 DIS will provide interpreters for these classes and snacks too! How do I register? Email Crystal Tower at CTower@deaf-interpreter.com or you can call on our VP. VP# 210-888-0039. Register by January 4th, 2017 to hold your spot. Come & join us for a monthly deaf chat at Granzin BBQ! When you enter the restaurant, get in the line to order your food/drink, and then meet us in the party room in the back! (6 pm-9 pm) Bring your family & friends! We will head to Starbucks following the event (9 pm-11pm) to chat more! WEBINAR - Board for Evaluation of Interpreters Test Overview: What is the Test Testing? 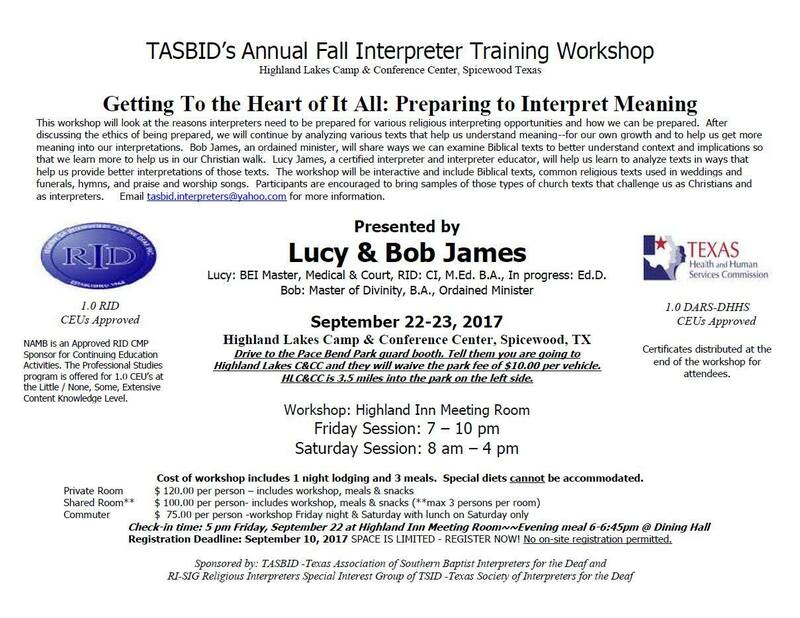 This training opportunity is presented by the Texas Health and Human Services Office of Deaf and Hard of Hearing Services (DHHS). For any questions please email dhhs.webinar@hhc.state.tx.us or call (512) 982-1709. Amanda Tuite, Communication Access Specialist, will discuss Title I of the Americans with Disabilities Act (ADA). Title I of the Americans with Disabilities Act of 1990 prohibits companies from discriminating against Deaf employees. The role of an interpreter when encountering discrimination will be discussed, and participants will come away equipped with strategies to apply in those situations. 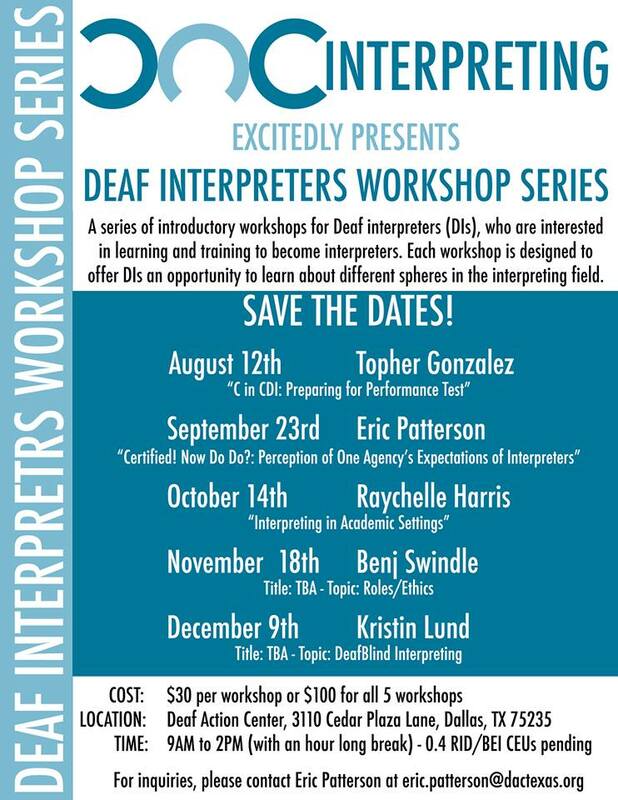 - utilize strategies to educate consumers and refer to appropriate resources within the role of an interpreter. Email dhhs.webinar@hhsc.state.tx..us or call (512) 982-1709 with questions. This webinar will be presented in American Sign Language (ASL); voice interpretation will be provided. To earn CEUs, participants must take a pre-test (link in registration confirmation email) and a post-test (link sent following the webinar), and also remain actively engaged in the webinar via random interactive polls throughout the session. If you need RID CEUs, contact an RID CEU provider in advance of the session to request PINRA approval to earn CEUs. There is an increasing importance being placed on the role mathematics signs play in teaching and learning in the classroom. Many teachers and interpreters have different signs for certain mathematics terms and it is possible that a lack of standardization may influence learning. There is a particular need to discuss perceptions of education for the deaf. This workshop was designed to assist new and experienced mathematics teachers and interpreters for the deaf as well as students interested in learning about mathematics signs. Most teachers and interpreters did not have signs for advanced mathematics terms and finger-spelled those terms to avoid inventing signs. This workshop helps you to be familiar with mathematics terms and how to apply to interpreting settings. The workshop will be conducted in ASL. English interpretation will be provided if requested before January 27. Deaf interpreters will be on site. Visit alamocitycomiccon.com for more information and ticket details. Hosted by Tanner Ashley. Feel free to contact him on Facebook for more info. San Antonio College-ASL/IT has Fiesta Tickets and Parking tickets ON SALE NOW throughout the summer! You will save money to purchase tickets and parking at SAC-ASL/IT. Seek Lab Director-David Solis at 210-888-0028 or meet him at the lab Nail Technical Center Room 110.
Who can buy the tickets? ANYONE!! Not limited to Deaf or Hearing Loss. Anyone who supports the DEAF AWARENESS DAY can purchase tickets at the lab and save MONEY!! NOTE: THE LAB WILL BE CLOSED ON JUNE 2ND! So, if you are planning to go to Fiesta Texas on June 3rd, then you would need to buy tickets before June 1st from David Solis. If you want, you can buy tickets at Fiesta Texas but it will cost more at $33.50 per person (with tax) and parking would be $20! Come on down now and purchase your tickets here at San Antonio College-ASL/IT. See you there!!! Please share! Come one, come FUN, COME ALL! When you enter the restaurant, get in the line to order your food/drink, and then meet us in the party room in the back! Then, we will go to Starbucks afterwards (9 pm-11pm) to chat more! River City Interpreters for the Deaf (RCID) has reported a murder to the Texas Society of Interpreters for the Deaf (TSID) conference committee. Conference co-chairs, Sharon Nodine and Michelle Theiss, are beginning their investigation. We need your help! “Private Investigators” will meet in San Antonio at the Hyatt Regency Hotel, 123 Losoya Street, on June 15-18, 2017. Student Private Investigators will be trained June 14-15. We will get to the bottom of this mystery, but we need your help. Please go to the TSID website to register. We need YOU to “Come to the Scene in 2017! Come and enjoy on an outdoor patio with delicious drinks! This ASL social is open to ALL ASL levels from student learners and beginners, to advanced and professionals! 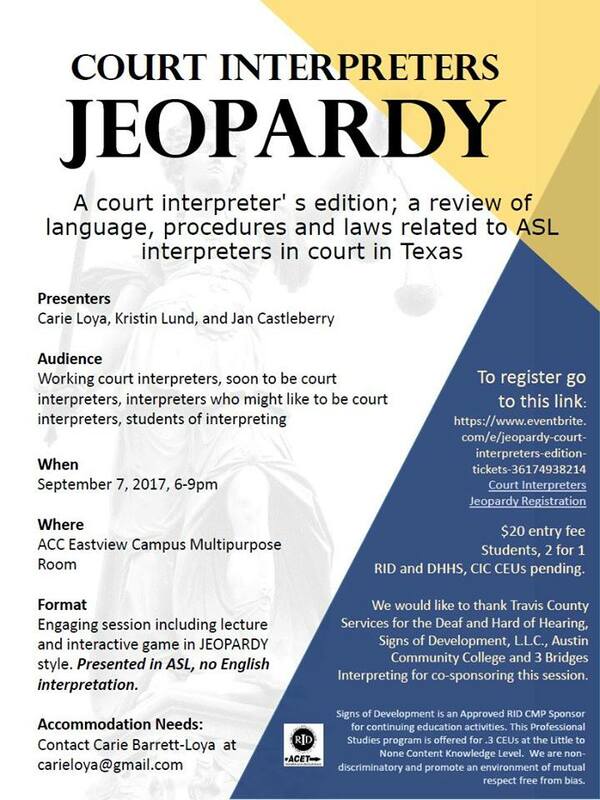 Come one, come FUN, COME ASL! Enrollment for the 2017-2018 Fiesta Especial Royal Court program is NOW OPEN! Deadline to enroll in this FREE Leadership and Life Skills development program is Friday, August 25th. Sign-up now for a program overview! Children and adults, ages 10 years and older, who have a physical, cognitive or sensory disability are encouraged to enroll. Please come join us for lots of fun, laughter and to make some new friends. Need to practice, or just want to learn? This is the place to be! All ASL levels welcome - new or fluent! For additional information or directions, please text our host, Sher, at 210-387-9328. What: San Antonio Americans with Disabilities Act (ADA) celebration begins with a lively Pep Rally! 50 Diverse Community Resource Exhibitors, ADA T-shirts, Community Awards, Drawings and Free Lunch for Attendees! Our Honorable State Representative Diego Bernal from District 123 will be honored as our Public Servant of the Year! The 27th Anniversary of the Americans with Disabilities Act (ADA)celebration will focus on the importance of ensuring that everyone in our community has access to programs and services and included in all aspects of life! To celebrate the 27th anniversary of the ADA, San Antonio Independent Living Services (SAILS) is partnering with and extends special thanks to our sponsors: Aetna, Clear Captions, Coverage2Care, Cubie Co., Deaf Interpreters Services, Inc., Frost Bank, Golden Outlook, Goodwill Industries, Gordon Hartman Family Foundation, Grande Communications, Harris Power Trio, Job Finders, Molina Healthcare, United Healthcare, Humana, Legacy Home Health, Premier Prosthetics, PCSI, VIA Metropolitan Transit and more! Program Description: If you are looking for worthwhile workshops, great entertainment, and a chance to sharpen your skills, then this immersion experience is for you! This will be the 9th year of the Silent Weekend. This is a skill development activity over three days, conducted completely in ASL. in 2016, this event brought over 225 participants from Canada and all over the US--even Puerto Rico! Who Should Register: Everyone! 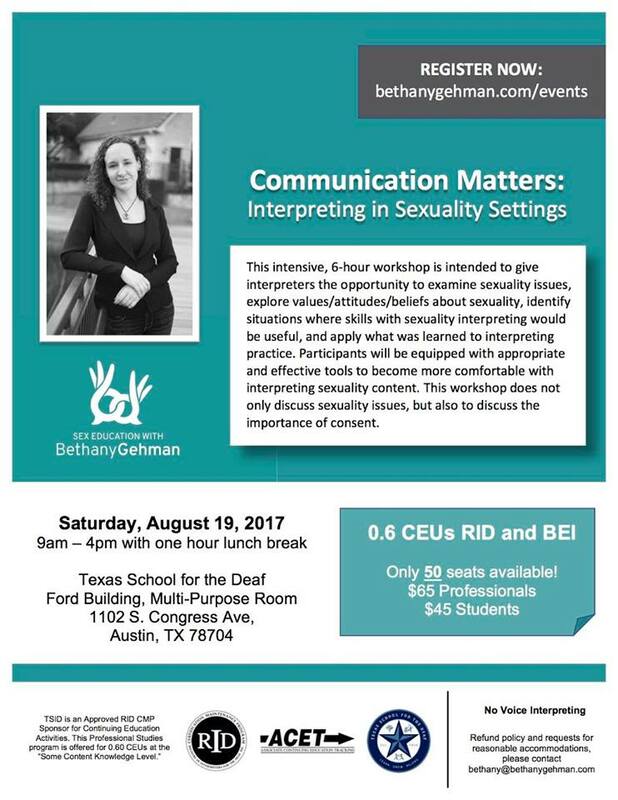 Deaf community members, ASL students, interpreting students, pre-certified and certified interpreters, ASL teachers and interpreter educators. RID CEUs: 1.9 CEUs will be offered in the categories of Professional or General Studies by the Regional Resource Center on Deafness at Western Oregon University, an approved RID CMP and ACET sponsor. Webpage in progress. All info can be found at registration link here. Questions? Contact CM Hall or call 503-888-7172. Will have booths, football games, volleyball games, alumni activities, food & family fun! Come & join us for a monthly deaf chat at Granzin BBQ! Bring your family & friends! Then, we will go to Starbucks afterwards (9 pm-11pm) to chat more! There will be food, face painting, bounce house, games, Cosplay, and backpack giveaway. 1st National Open Invitational Tournament in Austin, TX. DWBA’s very first National Open Invitational Tournament to host for all Deaf Women Ballers from all over the USA & International. Discounted ticket price starts at $10. Waco Deaf Bowler Association is hosting TWO tournaments on Friday and Saturday. Friday is the 11th annual mixed handicap bowling tourney. Saturday is the 6th annual South mixed bowling tourney. Fans admission $5 on Friday, $10 on Saturday. It’s Family and Kids Friendly night!! 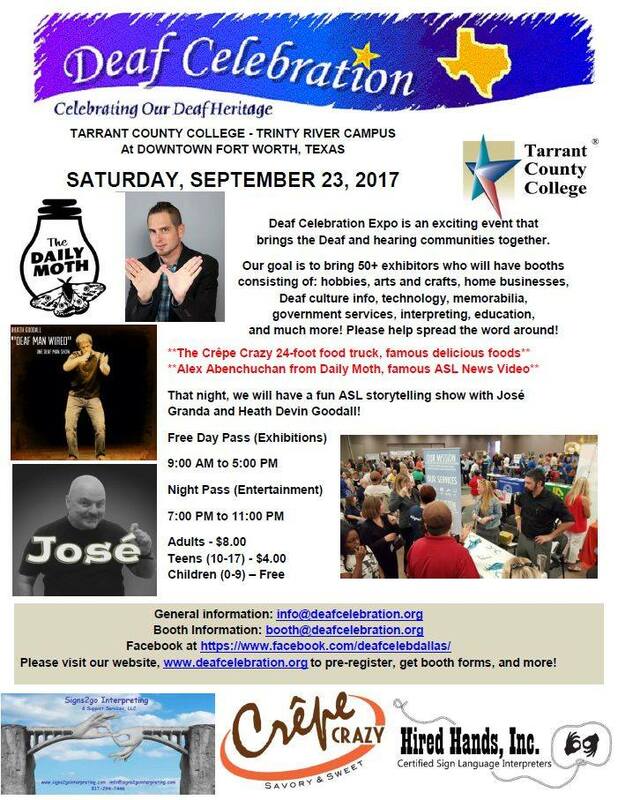 Visit www.deafcelebration.org to pre-register, get booth forms and more info if needed! Any questions or information requests on poker rules, payout structure, and such, please contact us at wasptour@gmail.com or visit www.wasptour.com. Join Boerne nonprofit organization for the 3rd annual Aid the Silent 5K walk/run at the Boerne Main Square Plaza on October 7 @ 8am. This event is open to all runners and walkers of every fitness level. Join us as we walk/run to help the deaf/hard-of-hearing community in the scenic Boerne riverwalk. Take advantage of the earlybird deal at $30 until 8/12/17. Registration is free for deaf/hard-of-hearing with special code. Contact us at 830-249-1744 or denise@aidthesilent.com. Register at aidthesilent.com/5K. There will also be booths there as well. Friday Kickoff is @ 7 p.m., Saturday Main Event is @ 11 a.m. & Saturday Bounty is @ 8 p.m. Welcome alumni and guests! There are a lot of exciting activities and events planned for you to enjoy and opportunities to reconnect with Gallaudet and old friends! Orientation is the first step in becoming a Texas Licensed Court Interpreter, as it's a prerequisite to sitting for licensing examinations. No other orientation rivals TAJIT's--where you will experience a real courtroom and learn from experienced instructors who are both Texas Licensed and Federally Certified Court Interpreters. Registration details will be published soon but mark your calendar today to save the date! SAVE THE DATE! Contact Phoenix Day School for the Deaf for more info. SAVE THE DATE! Hello friends! It has been a very long time since we've all seen each other since living together in the phases, meeting at the gazebo, eating at the circular table at the dining hall, or even waiting for class in the lounge at the SH building! If you are an alumni or even a previous student, you are invited for an ASL Reunion for the 2017 LU Homecoming! We are planning on tailgating, attending the game, and then head out to Luke's and then for a night out for old times sake! We're getting an early start so we can start finding hotels and budget. I'll update with more info as we get closer! This is a perfect opportunity to catch up and socialize with old friends and meet new ones! Deafpokertour@gmail.com for hotel reservations or www.deafpokertour.com 512-410-6602 if have any questions. 1) Benefits Management / Financial Planning, 2) Community Education & Public Awareness, 3) Education, 4) Employment, 5) Faith & Spirituality 6) Legislative & Legal, 7) Health & Nutrition, 8) Residential Options, 9) Support Services, 10) Recreation-Socialization, 11) Transportation, 12) Therapy & Rehabilitation, and other areas of interest as they are identified.